Email Headers Analyzer is designed to help you parse, interpret, and trace message headers in a convenient and comprehensive way. It takes just one click of a button to open Outlook Internet headers and get all details neatly organized under several tabs in one window. 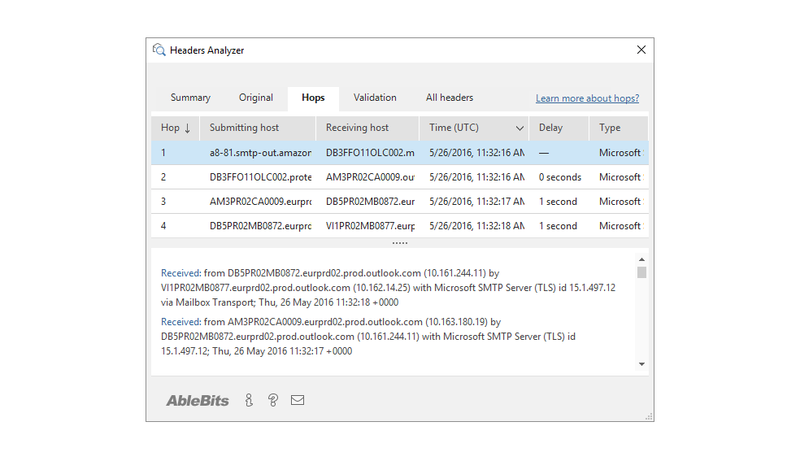 Access message headers in Outlook in one click See a breakdown of all server hops and the time between them. Get authentication results and spam check details Click on a header to navigate to its details in the add-in window. What is Outlook email header? If you ever had to troubleshoot email system or delivery issues, you know about Outlook email headers. They contain technical information about the sender, the software used to compose a message, and servers it passed on the way to the recipient. Email headers help understand why it takes some messages so much time to arrive, why some of them end up in the Junk folder, and what hops they take before arriving at the inbox. 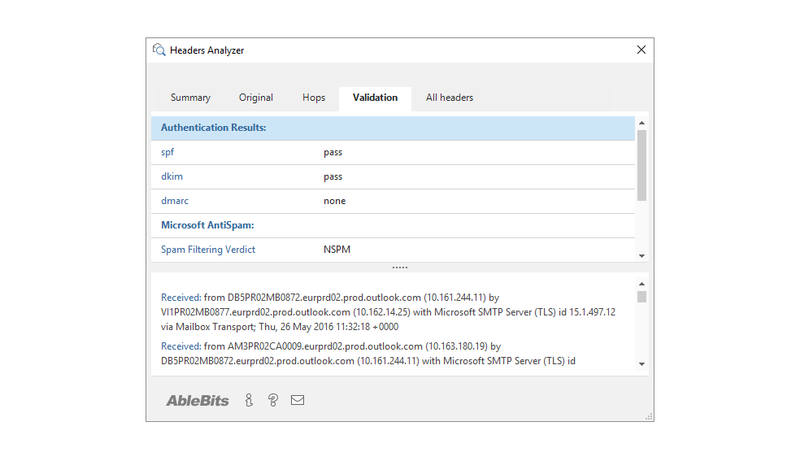 What is Email Headers Analyzer and what do I need it for? 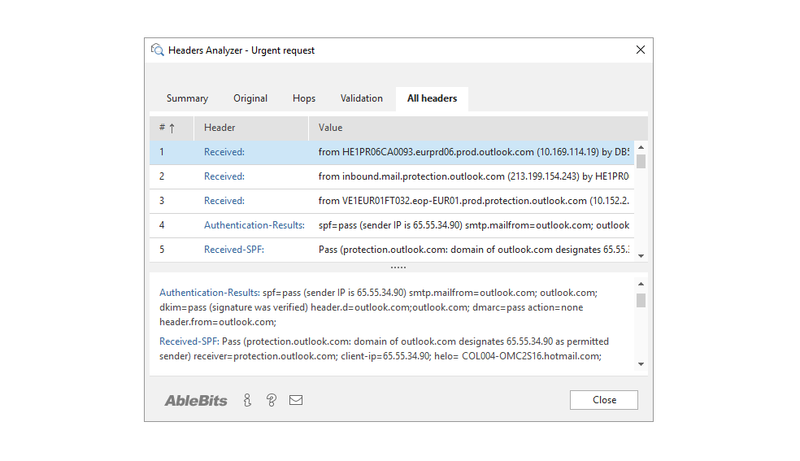 The tool is a part of Ablebits Outlook Add-ins Collection. It is created to help you parse, interpret, and trace message headers in a convenient and comprehensive way. 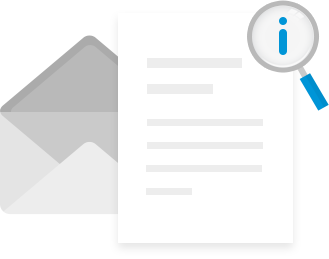 Outlook email headers provide you with most useful information for diagnosing mail problems. 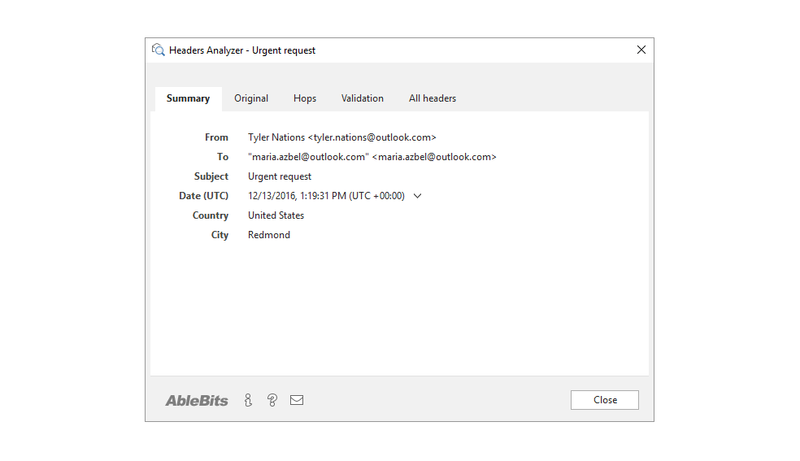 Email Headers Analyzer helps you retrieve message headers for further checkup and displays the data for you in an easy-to-read manner. How to use Email Headers Analyzer? After installing the add-in, you will see the its icon under the Ablebits.com tab. To trace email headers, just select the needed message, click on the Email Headers icon in Outlook and view headers information parsed into 5 tabs.